Three. Modern hunt and gather. Yesterday I was busy and when I got home from work, I paid attention to my kid instead of this blog. And then I went to sleep, after of course sending notes to my internet friends. That’s how it should be. Monday I maintained a high compliance level on my food choices. And I lifted at the gym. 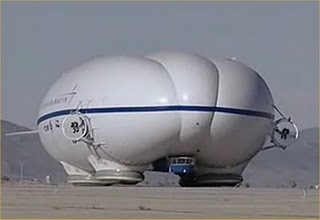 I have a 10 km race on Sunday, so I would prefer to get my two lifts done by Wednesday. But given how my legs feel after my speed workout today on the treadmill (to avoid living green things outdoors), I probably won’t lift again tomorrow. I finished the treadmill run by working on my core. I couldn’t finish all 30 reps of the exercises and needed to pause in the middle. I am wondering if low carb = low power. I think I will adapt. I’ve read that many athletes enjoy higher performance once they adapt to lower amounts of sugar in their diets. Monday roll call on the eats: Coffee and cream. 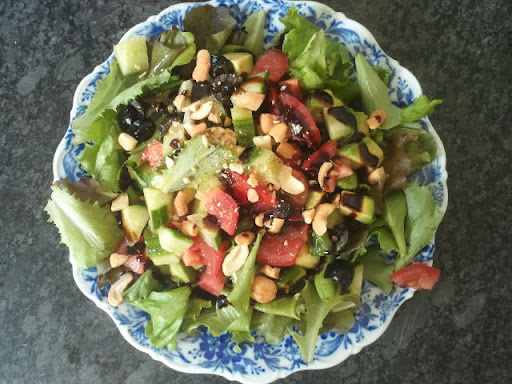 Shrimp, walnuts, h-b eggs, spinach, avocado, red pepper; Fish, more peppers, black olives, lettuce. Half decaf coffee. Leftover turkey, zuchini, broiled tomato, gazpacho soup. Herb tea. So today’s photo is the result of my hunt & gather this morning. Before panic set in, I looked at what was on the counter and in the fridge and grabbed what was available. It served as lunch and dinner and I feel quite satisfied. I’ve stopped leering at fruit. Almost. I did squeeze little bits of lime and lemon into my water at the gym. Food roll call: Coffee and cream; bacon and eggs with lettuce and tomato; lettuce, ham, h-b eggs, walnuts, V-8 juice, yellow pepper, avocado. I’m going to need to restock soon. Training tip: high performance requires mental training too. If I broke my concentration while working hard on the treadmill, I stopped running as hard. I need my body to tell my brain that I can do this. And vice-versa. My brain needs to tell my body what to do. Neither can wander off while the other is working. Sometimes when I thought I couldn’t sustain the pace on the treadmill for the whole interval, I simply counted my steps up to 20 or 50 or something. Totally pointless concentration that focused my attention on the Here and Now. Counting helped me to stop looking at the timer and thinking about whether I could sustain the pace for the whole interval. Hard boil the eggs for 10 minutes in boiling water. Place in cold water to cool them, then peel the shells and slice them in half lengthwise. They are easier to slice if you run the knife under cold water before each slice. Remove the yolks. Purée the sardines with the lemon juice, yoghurt and mustard. I used a wand blender and Greek Yogurt. Work the egg yolks into the mixture and season to taste. I used a whisk to break up the egg yolks. 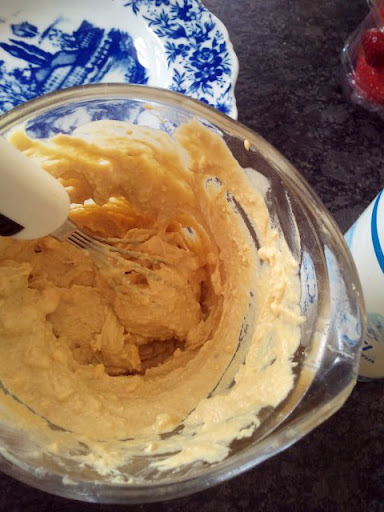 Either I was heavy-handed with measuring the yoghurt and mustard, or the proportions for the recipe aren’t right. If the consistency of the filling is too soft, add another cooked egg yolk. Add the chopped parsley to the stuffing mixture. 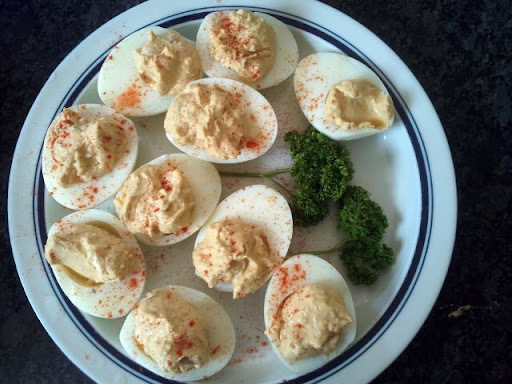 Stuff the eggs with the mixture and sprinkle with paprika. Refrigerate until serving. My teenage son saw the plate and said, Oh! Can I have some? That’s the sound of a success. 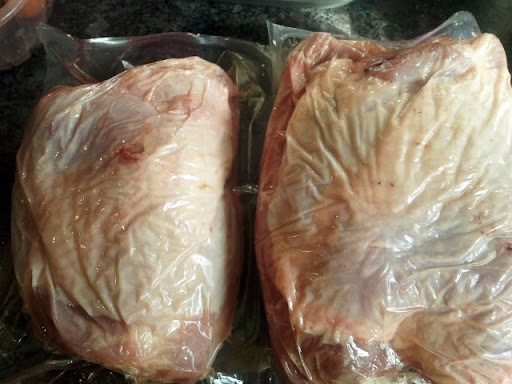 Three turkey thighs, with skin, on the bone. About 1.5 kilos. I’m making three because of feeding teens and wanting leftovers. My theory is cook once eat twice. Hopefully the teens will leave some leftovers. Preheat the oven to a hot oven. 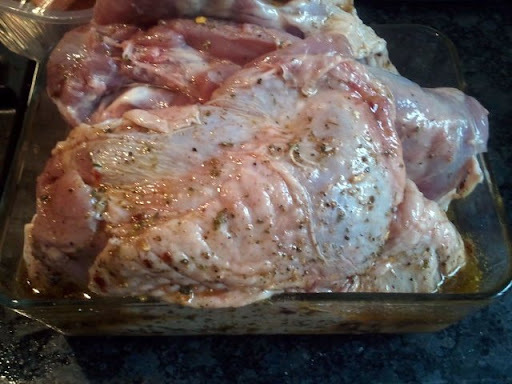 a couple tablespoons (total) of some poultry spices: black pepper, dry mustard, salt, coriander, thyme, marjoram, sage, parsley. Procedure: mix up the marinade/basting sauce. Let the turkey sit in the marinade for a while. All afternoon if you thought about it in advance. A few minutes while the oven heats up if you sat on the couch reading a book, like I did, on endurance training for athletes. 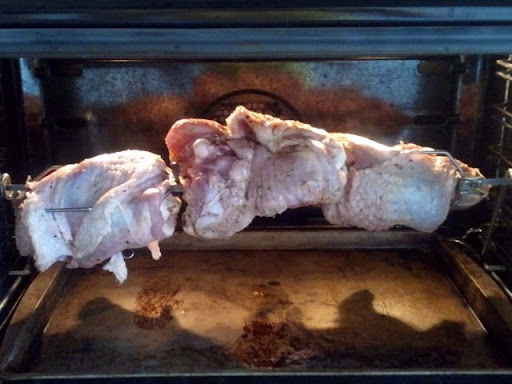 I am using my oven’s spit rotisserie. Here is very nicely-photographed explanation for trussing the meat. My best friend Julia Child recommends smearing butter on the skin and using twine to secure a layer of bacon over the meat. It’s a good idea, but I don’t have any twine. So I haven’t “barded” the meat with bacon either. I’ve done that before and it’s delicious. 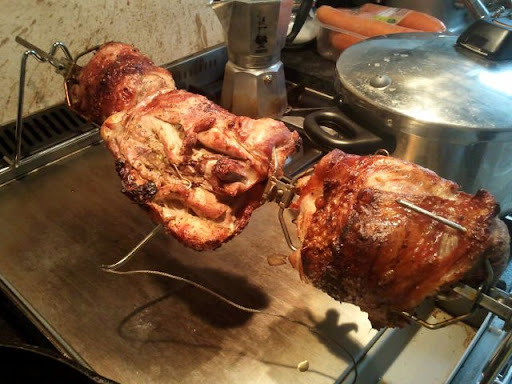 I’m using small skewers to pin the thighs around the rotisserie. When is it done? Julia says roasting a whole chicken takes 45 minutes plus 7 minutes per pound. To be safe, she recommends adding a buffer of between 10 to 30 minutes. The rotisserie instructions I linked above say “check your user’s manual” and that the bird pictured below takes two hours. I use a meat thermometer and will start checking the thighs after about 45 minutes. The thickest part of the thigh is fully cooked at 175 degrees F. The temperature will continue to rise after the turkey has been removed from the oven. The meat will brown as it cooks. (Sorry, I couldn’t resist including the animated chicken.) Since I will be in the kitchen making side dishes, it will be easy enough to check. Besides, a delicious smell will tell me when the food is just right. If you don’t have a rotisserie in your oven, dig out your Thanksgiving recipes and roast the thighs in a pan until done. UPDATED: the turkey was done in an hour. For side dishes: raw cucumbers, peppers and tiny grape tomatoes with Caesar dressing for dipping. Barely cooked melange of carrots, cauliflower and broccoli. 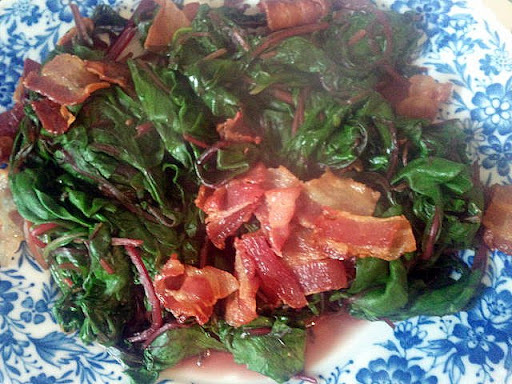 Red chard sauteed with bacon pieces. These are to inspire you. They’re easy to assemble and taste good. 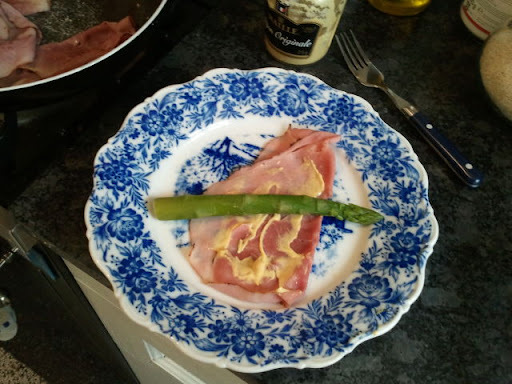 asparagus stalks – at least one per slice of ham. Boil the asparagus until it’s just barely tender. I usually cook them in a frying pan in a single layer, just covered with water. Stare at them so you don’t over cook them. They are Done when bright green. Test them by piercing the stalks with a fork. 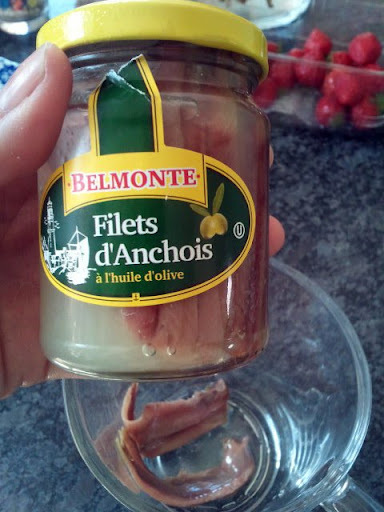 Saute the ham in a skillet to take the chill off the meat and bring up the flavour. Spread some mustard on each slice. 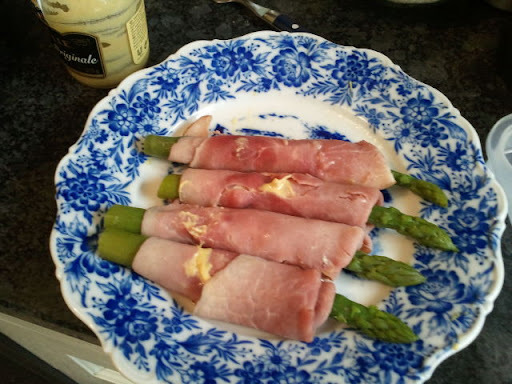 Put one or two asparagus stalks on the slice and roll. I said I’d post every day, and now that I have a massive subscriber list, I will keep my word. I need to get up at half six to feed my boy and cycle in the morning, so this is a shortie. Food. I asked myself what was I hungry for and listened. I felt like I ate a lot, but it was just the right amount. Training tip: find someone to do it with. For some reason we will keep agreements we make with someone else more readily than we will with ourselves. In other words, we will let ourselves off the hook and show up when we’ve promised someone else. I made a plan to run with A. today at lunch. 11:45, to be precise. And it was in my appointment book. And I had my shoes and other gear. See yesterday’s tips. A wobbled when I phoned her to see when she’d be ready to go. A birthday lunch had arisen. She called the birthday boy, who wanted to celebrate next week instead. A called me back, and I said she had no excuse but to lace up. Truth be told, I felt "too tired" and felt in the verge of being hungry. But we ran and had a great time. I like her company and we are evenly paced. And it was sunny. So, find a buddy and keep your agreement. No skips.